I told ya’ll, November was about baby gifts. And I’ve got two more finished baby gifts fresh off my needles! First up, let’s talk about the Wee Sherlock cardigan. I haven’t made this one in a while and I forgot how much I love this pattern. And my girlfriend told me she liked this particular pattern because it was easy to put on a newborn and didn’t get caught under their neck rolls LOL. And I also decided to give a dress, and I made the Autumn Frock pattern, which I haven’t made in a while (note, the pattern does have a minor errata at the neckline that they haven’t updated, fyi if you knit it). I knit both pieces with Caron yarn but added in Red Heart Gumdrop yarn for the dress. The sweater is with Caron Simply Soft and the dress uses Caron Simply soft for the edgings and Red Heart Gum Drop in orange. 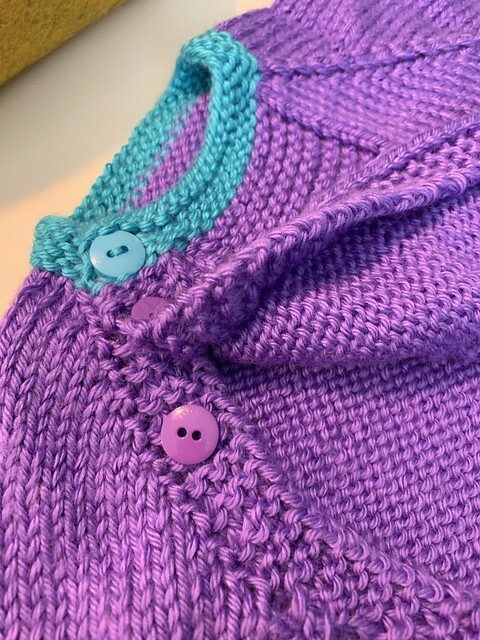 But why is my favorite part of any cardigan picking the buttons? My button stash runs deep and I went with coordinating buttons for this piece. I can’t wait to see baby Abigail in her new knits! And I’ve already got another baby item on my needles as we speak! Baby knitting month continues. Any other great baby patterns out there that you love? 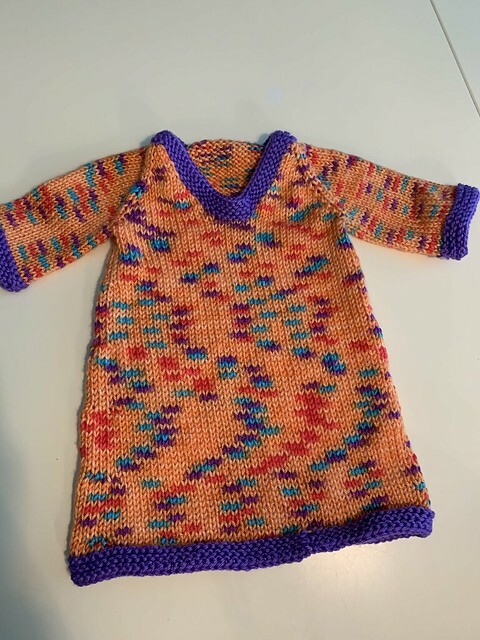 I knit my granddaughter Frock and Bubble, by Jennifer Miller, during the summer so I could take it to her First birthday! Turned out soooo cute…and too large :).I would attach a pic but idk how! Just looked it up on Ravelry and it’s an adorable pattern! I might need to add that one to my list! Totally awesome! I LOVE that gum drop! What a great combo!!! So cute!!! And so up to date! I haven’t made this by myself, but I really love the pattern. Some day, who knows? 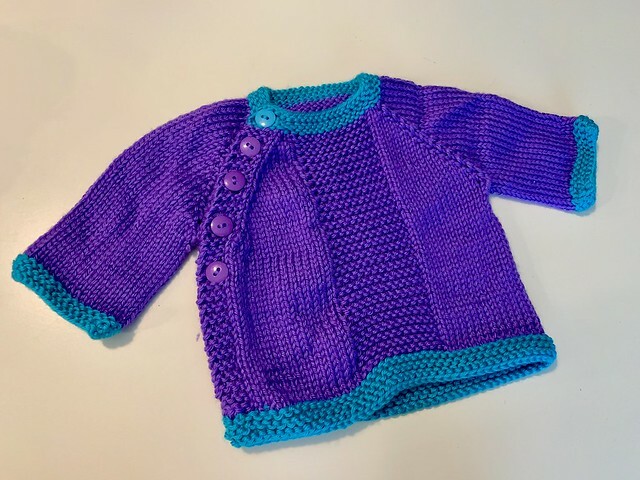 A really cute and quick baby sweater is The French Macaroon, free on Ravelry. Striped Pants by Mel Clark. I think I’m on pair #3 for my little guy because we live in California and these cotton pants aren’t too warm for him. 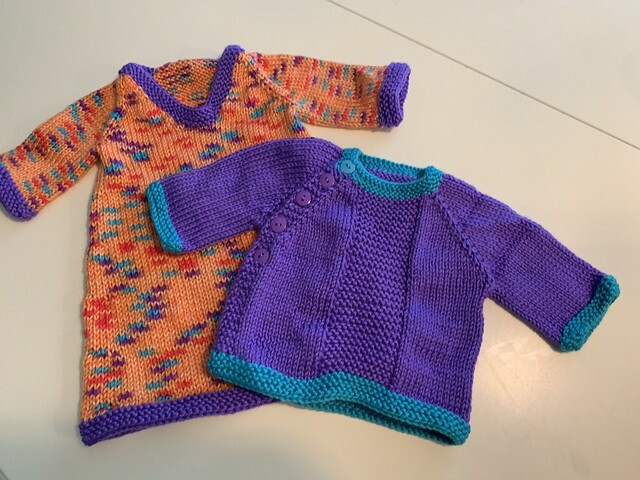 🙂 I just keep adapting the pattern upward, but the sizes are 0-6 months, 6-12 months, and 12-18 months. So cute. And machine washable!!! Love both of them! I’m in the middle of a Lego sweater for a toddler. So cute!